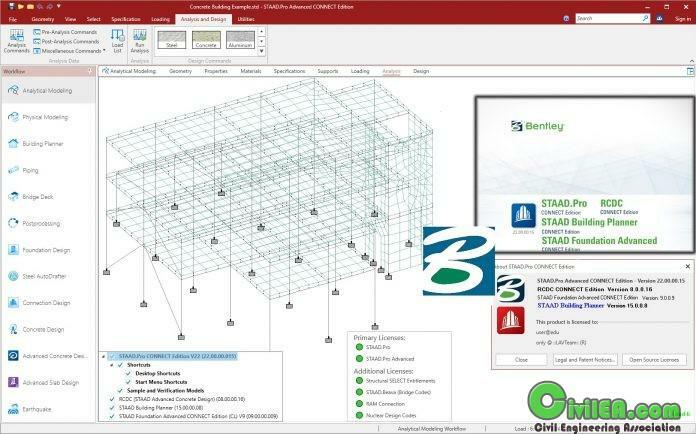 Perform comprehensive analysis and design for any size or type of structure faster than ever before using the new STAAD.Pro CONNECT Edition. Simplify your BIM workflow by using a physical model in STAAD.Pro that is automatically converted into the analytical model for your structural analysis. Share synchronized models with confidence for multi-discipline team collaboration and, most importantly, deliver safe, cost-effective designs. Confidently design steel, concrete, timber, aluminum, and cold-formed steel structures anywhere in the world using over 90 included international design codes, regardless of which STAAD option you choose. Automatically convert your physical model into an analytical model to streamline your workflow. Improve multi-discipline team collaboration through broad interoperability with Bentley desktop and cloud and mobile applications like AECOsim Building Designer, AutoPIPE, Revit, and Tekla. Optimize concrete and steel BIM workflows with the full integration of physical members and surfaces. Run many design alternatives in parallel with STAAD’s cloud services and view the results in clear, graphical side-by-side comparisons. Design for high-seismic regions or everyday conditions, using Finite Element analysis.